How can I most easily model and measure a ceiling jump with RFEM? Basically, one has to decide first whether the consideration of the cover jump in the static model is relevant or not. 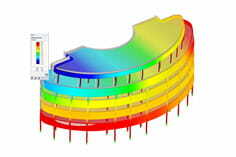 If the jump in the ceiling is to be taken into account when calculating the internal forces, this can be depicted in RFEM as a surface model (folding unit) (see Figure 1). The resulting surfaces (horizontal surfaces of the ceilings, vertical surfaces of the vertical offset) can then be dimensioned using RF-BETON surfaces. Optionally, you can also integrate the area intersection sizes, which were determined in this ceiling discontinuity, into stump sizes. For this purpose it is recommended to use a "result bar" (see picture 2). The stump sizes of the result bar can then be used subsequently for design in RF-CONCRETE Members (see Figure 3). You will find further information on the application of the results bar for ceiling design on our homepage under the following links.